Krakow’s own Agnieszka Radwańska has felt the glory of getting to what is arguably the most important and most famous major tennis final in the world – and now she’s tasted the bitter disappointment of defeat, having been beaten in the women’s singles competition at Wimbledon. Radwańska was up against the favourite Serena Williams, who proved too much for the Pole, winning 6-1, 5-7, 6-2. After losing the first set, and already 4-2 down in the second, Radwańska put up the fight of her life to draw level. It looked for a time as if she had Williams flummoxed, for the American seemed unable to keep up. Ultimately, though it was Williams who found the reserves to take the crown – her 14th grand slam singles title so far. Radwańska, though, still has plenty to be proud of. Not only is she the world number three, but she is also the only Polish woman to have reached a grand slam final since before the World War II. ← Euro 2012: Where Was the Hate? Considering the difference in experience and strength between them, I think Agnieszka put up an amazing fight! Just remember her wonderful ‘awakening’ in the second set. It looked like Williams wasn’t expecting that and my hopes really went high. Too bad about the defeat, but what a show it was. Congratulations to Agnieszka for being the only woman to take a set off Serena Williams in a Wimbledon final (except her sister Venus) and for making it such an exciting match. Imagine what she might have managed to achieve if she was 100% fit and not suffering the after effects of the wet British summer! Her rewards? Leaping to the no. 2 slot in the workd and being nominated by the Polish Olympic Committee to carry the flag at the opening ceremony of the 2012 London Olympics. 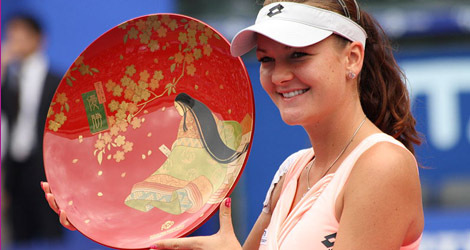 Be proud of her achievements – bravo Aga!